What parts of the neck are affected? The spine is made of a column of bones. Each bone, or vertebra, is formed by a round block of bone, called a vertebral body. The spinal canal is a hollow tube formed by the bony rings of all the vertebrae. The spinal canal surrounds and protects the spinal cord within the spine. There are seven vertebrae in the neck that form the area known as the cervical spine. The vertebrae are separated by intervertebral discs. The intervertebral disc sits directly in front of the opening. A bulged or herniated disc can narrow the opening and put pressure on the nerve. A facet joint sits in back of the foramen. Bone spurs that form on the facet joint can project into the tunnel, narrowing the hole and pinching the nerve. Foraminotomy alleviates the symptoms of foraminal stenosis. In foraminal stenosis, a nerve root is compressed inside the neural foramen. This compression is usually the result of degenerative (or wear and tear) changes in the spine. Wear and tear from repeated stresses and strains on the neck can cause a spinal disc to begin to collapse. As the space between the vertebral bodies shrinks, the opening around the nerve root narrows. This squeezes the nerve. The nerve root is further squeezed in the foramen when the facet joint lining the outer edge of the foramen becomes inflamed and enlarged as a result of the same degenerative changes. The degenerative process can also cause bone spurs to develop and point into the foramen, causing further irritation. 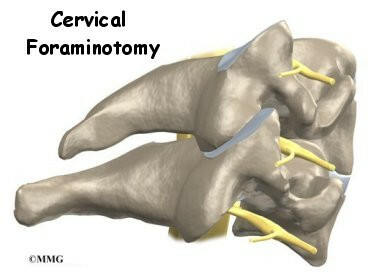 In a foraminotomy, the surgeon removes the tissues around the edges of the foramen, essentially widening the opening in order to take pressure off the nerve root. Patients are given a general anesthesia to put them to sleep during most spine surgeries. For shorter procedures such as foraminotomy, patients are usually given a gas form of anesthesia through a mask. As you sleep, your breathing may be assisted with a ventilator. A ventilator is a device that controls and monitors the flow of air to the lungs. This surgery is usually done with the patient lying face down on the operating table. The surgeon makes an incision down the middle of the back of the neck. The skin and soft tissues are separated on the side where the spinal nerves are compressed. Some surgeons use a surgical microscope during the procedure to magnify the area they'll be working on. The surgeon may use a small, rotary cutting tool (a burr) to shave the inside edge of the facet joint. This opens up the outer rim of the neural foramen. The burr is sometimes used to shave a small section of the bony ring on the back of the vertebra above and below the affected nerve root. Small cutting instruments are used to carefully remove soft tissues within the neural foramen. The surgeon takes out any small disc fragments that are present and scrapes off nearby bone spurs. In this way, tension and pressure are taken off the nerve root. The muscles and soft tissues are put back in place, and the skin is stitched together. Patients are sometimes placed in a soft collar after surgery to keep the neck positioned comfortably. Many patients get nearly complete pain relief from the foraminotomy procedure. As with any surgery, however, you should expect some pain afterward. If the pain continues or becomes unbearable, talk to your surgeon about treatments that can help control your pain. Rehabilitation after foraminotomy surgery is generally needed for only a short period of time. If you require outpatient physical therapy, you will probably need to attend therapy sessions for two to four weeks. You should expect full recovery to take up to two or three months. Your therapist works with you on how to move and do activities. This form of treatment, called body mechanics, is used to help you develop new movement habits. This training helps you keep your neck in safe positions as you go about your work and daily activities. At first, this may be as simple as helping you learn how to move safely and easily in and out of bed, how to get dressed and undressed, and how to do some of your routine activities. 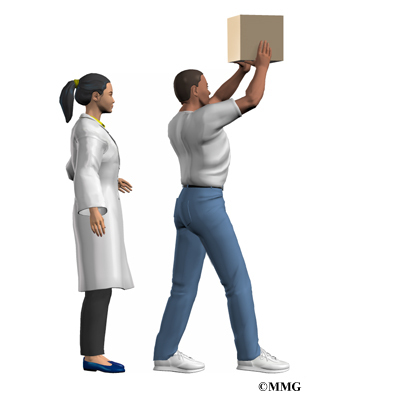 Then you'll learn how to keep your neck safe while you lift and carry items and as you begin to do heavier activities. As your condition improves, your therapist will begin tailoring your program to help prepare you to go back to work. Some patients are not able to go back to a previous job that requires heavy and strenuous tasks. Therapists may suggest changes in job tasks that enable you to go back to your previous job. They may also provide ideas for alternate forms of work. You'll learn to do your tasks in ways that keep your neck safe and free of extra strain.